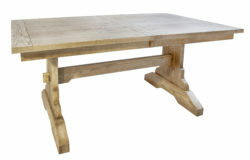 A blend of a pedestal and a leg table, a trestle table is characterized by the presence of multiple supports that are connected by the table top. 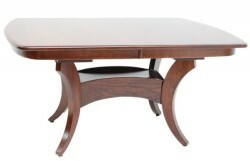 Offering the same flexibility of seating as a pedestal table, trestle tables can play host to large and small gatherings with ease. 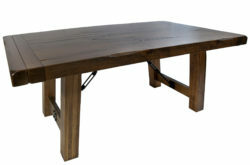 Table tops include popular modern and live edge styles, as well as more traditional options like Mission and Shaker styles. Each order is constructed to your individual specifications, which means that customers can select the size, stain color, number of leaves (not available with live edge options) and wood species. Additionally, tables are finished with a tough conversion varnish—allowing you to forgo the coasters and the worry of damage from everyday wear and tear. Crafted locally in Ohio, our Amish craftsmen employ the same precision skills and attention to detail that has made their furniture legendary for its beauty and durability. Like all our furniture, trestle tables from Amish Originals come fully assembled and will stand ready for this generation and the next. Call for a quote today, or drop by our Westerville, Ohio showroom to see how the vast array of options could suit your style and your dining needs.